The first report that something horrific was happening came at 12:47 p.m. on April 3. A Dynamic Signal employee sent a message on one of the company's office Slack feeds. That warning marked the start of a chilling incident where Dynamic Signal's two main offices went into lockdown. That afternoon, a woman entered the nearby YouTube campus and opened fire with a handgun, leaving three employees wounded before the assailant took her own life. "When the safety of our people is on the line, an accurate message is critical," said Katie Rubak, the Community and Social Media Manager at Dynamic Signal. Dynamic Signal's headquarters is located in San Bruno, about 10 miles south of San Francisco. That afternoon, a normally quiet office park that houses Silicon Valley companies suddenly buzzed with commotion. "You're never prepared for something like this," said Adonis Garefalakis, the Director of Human Resources. "But the most important thing is to find out as much as you can and then communicate it in a direct way to calm our employees." Dynamic Signal's Traeger office, which is nearest to YouTube's buildings, immediately was put on lockdown. 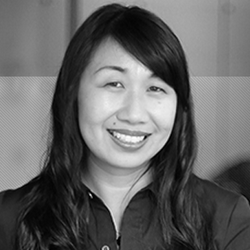 As employees at both offices began sharing on Slack what they were seeing on social media, Rubak knew she needed to alert employees with only the facts that were known. 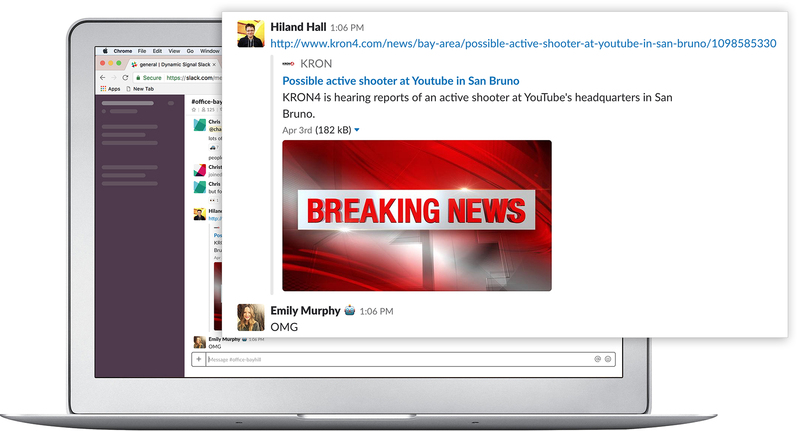 She sent out a broadcast on Dispatch, which is Dynamic Signal's own instance of our Employee Communication and Engagement Platform, telling employees about the police activity at YouTube. Although there was no immediate danger, employees needed to stay inside their buildings until the situation was resolved. "That first message had to be clear because there was so much on Slack with people jumping in with unverified information," Rubak explained. "It was all hearsay. We were careful how we worded that first message about no immediate danger. To us, immediate danger would have meant there was a shooter in one of our buildings. We needed to strike the right tone." In fact, no one else was in peril. But that wasn't clear at that moment, CNN was televising a scene where SWAT teams were entering YouTube buildings and frightened employees were being escorted outside. Speculation was being shared on social media. That's why, with so much conflicting information, the decision was made not to send a broadcast about an "active shooter," Rubak said. The concern was it could create unwarranted panic. "In a crisis situation, it's extremely important to share only what we can verify," Rubak explained. "We didn't want to share information that might later prove to be inaccurate." In a harrowing situation like this, it's hard for employees to know what's actually happening, Rubak said. But when an organization has one, top-down communication channel, everyone receives accurate information. 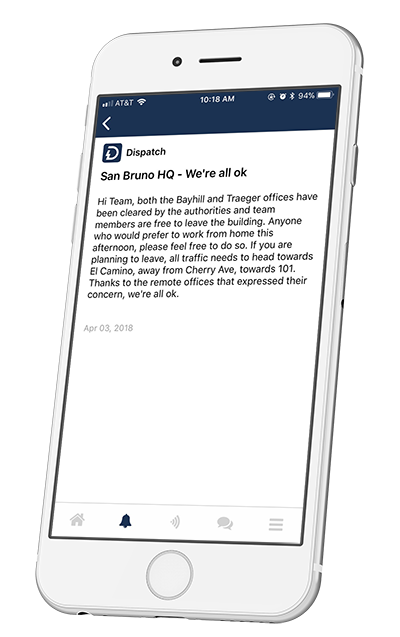 "Dispatch proved to be a great tool for emergency communication," Garefalakis added. "That's much different than Slack, which caused uncontrolled spreading of information and tension. That was very important in how we communicated useful information and contained the spread of unverified news and panic." All team members at Traeger and Bayhill, please stay inside. There is police activity going on at the Youtube campus (corner of Bayhill and Cherry). Please stay inside until further notice. There is no immediate danger, but please stay in your building until the situation has been resolved. Hi Team, both the Bayhill and Traeger offices have been cleared by the authorities and team members are free to leave the building. Anyone who would prefer to work from home this afternoon, please feel free to do so. If you are planning to leave, all traffic needs to head towards El Camino, away from Cherry Ave, towards 101. Thanks to the remote offices that expressed their concern, we're all ok.
"Only send out verified information that is actionable for your employees. The official news channel of our company is not the place to be speculating or sharing information we can't verify." "It's important to have one person in charge of the communication. There can be a problem if you have too many cooks in the kitchen. There was a small group of people who were helping me get our messages crafted. But there has to be a gatekeeper." "In hindsight, I might have sent a broadcast reminding people that they shouldn't be fueling speculation. Everyone needs to think carefully about what they're publishing on their personal channels so it doesn't add to any sense of panic."